DB11 - Counter display - Q-net International Ltd.
To help customers’ orientation counter displays are mounted above or beside the counter. Optionally stainless steel tube (OB01-C04G04 = 100 cm long or OB01-C04G00 = 50 cm long) can be used to fix it onto the table or on the ceiling. The display consists of three digits (50 mm, 5 x 7 dot matrix); their colour is bright white, but it can be covered with colour foil (blue, red, green etc..) to create an extra light effect. At calling event, the ticket number is blinking for adjustable time period (and blinking speed) on the display. The number is shown on the display until the teller presses CLOSE button of the calling unit. The DB11 display can swap between Arabic and English numbers, the swapping time can be adjusted in the Q-net Pro software. 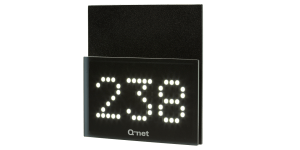 The DB11 display is available for Q-net Basic, Basic Plus and Pro systems. This entry was posted in Basic Counter Displays, Counter Displays, Hardware, Pro, Pro Counter Displays, Queue Management Systems, Solutions. Bookmark the permalink.